Last night, the Institute hosted its second Hard Hat Dinner. 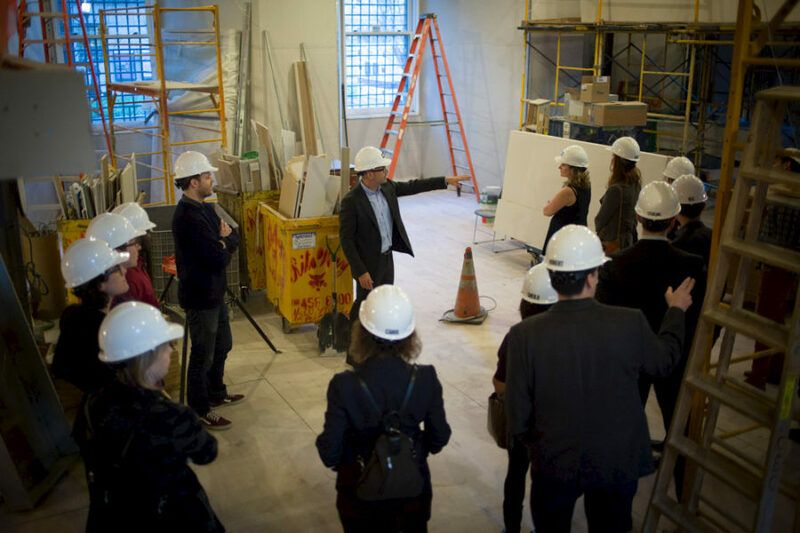 We invited 19 media scholars, educators, journalists, entrepreneurs, and friends for the second in a series of events to celebrate the construction of our new space. The evening started with a tour of the Brown construction site which has changed considerably since our first event at the end of February. Offices are roughed out, a subfloor is down and the sheetrock is almost complete. As with the first event, we then moved upstairs for dinner served between two large projections of the space captured the day before — Slowly moving videos panned around our space downstairs as the construction crew worked. Thank you to everyone who came… It was a lot of fun! Oh and a special thanks to Magic Grant recipients Jessa Lingel and Adam Golub for showing off their work before dessert! Ethics of Data Conference Announced!